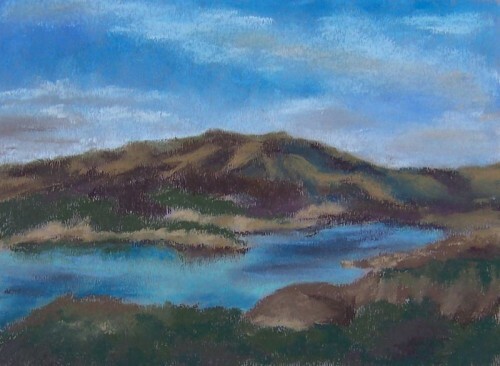 This entry was posted on Friday, August 10th, 2012 at 9:52 am	and is filed under Color, Landscape, Paintings, Pastels. You can follow any responses to this entry through the RSS 2.0 feed. You can leave a response, or trackback from your own site. In the recycling bin, you mean! You still built a well-composed scene,I think. I HATE inking on toothy paper. I stand corrected. The recycle bit it will be! Thanks for the positive comment! It has an impressionist quality probably due to the smudging, etc. It may have felt impossible to work with, but the result is quite pretty.